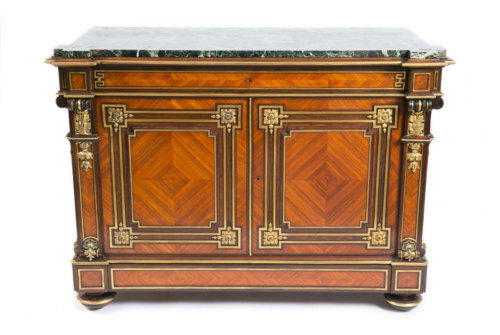 Waxing lyrical about one of her most fascinating French cabinet, from a quality perspective. 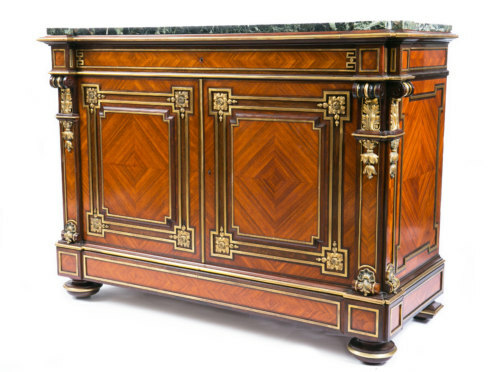 What: A 19th Century rosewood brass and ormolu french cabinet with a 30mm solid marble top. Where did you find it? In ‘Gay Paris’! Offered to me by a Frenchman I know, who sadly also knows we have a weakness for truly awesome antiques. There are plenty of fabulous french cabinets around. What makes this one so special? This really is a spectacular example of its kind. Regardless of whether you love or hate the design, anyone who is interested in quality and impeccable craftsmanship should be able to appreciate the love and skill that’s gone into creating this piece of furniture. Just look at the level of detail. You can see how painstakingly the marble has been shaped and cut in order to perfectly fit each corner. The timber mould has been done in the same way before being finally bordering with brass to complete the effect. These are expensive things to do and tremendously time consuming. 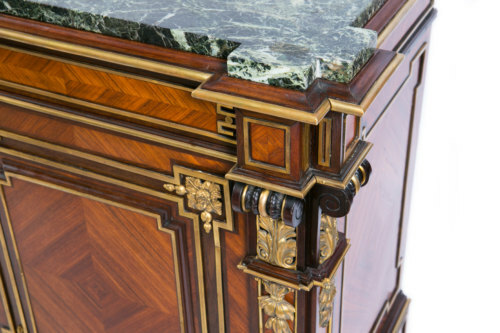 The frieze on this french cabinet looks especially intricate. How was this effect created? This is one of my favourite elements! It features large panels of cross banded and book-matched kingwood – a rare and hugely expensive wood. Each piece has been carefully cut and matched side by side to create the stunning geometric effect, then embellished with large ormolu mounts. This book matching has been matched right across the piece, showing an amazing level of attention-to-detail, and again…imagine the time. The execution of the ormolu flowers is absolutely stunning. 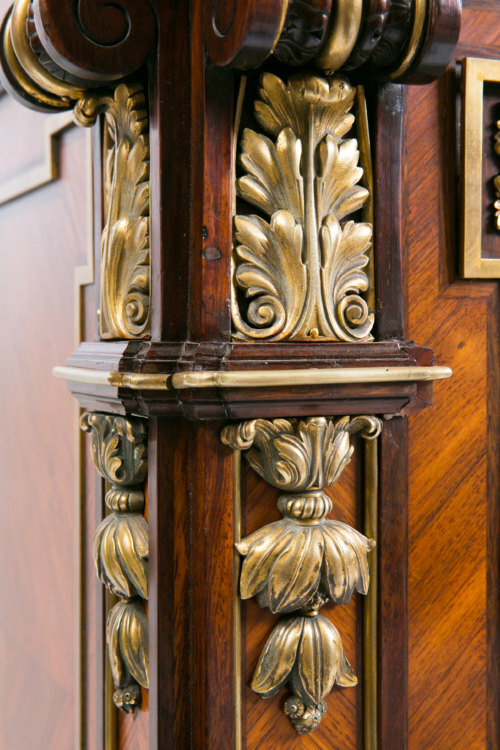 Unlike most applied ormolu, they don’t just sit flat on the piece but have been curved around the carved timber mouldings to give the impression that the leaves and flowers are bending around them naturally. This is a level of detail, time and workmanship you simply don’t see now. How long would it have taken to create a piece like this? Obviously this would all have been done by hand by just a handful of craftsmen, requiring hundreds of hours of painstaking labour. As just one example, every single piece of bronze has been cast in a mould, but then unlike today, where it is then plonked straight onto the piece, these designers hand-chiselled every piece by by hand to achieve the crispness and depth of relief you see in these. Then each one is applied with mercury and upon heating the bronze, the mercury vaporises and the beautiful gold remains. After this is complete areas of the gilding are burnished with an agate stone to highlight different areas. A piece with this level of detail would have taken anywhere from several months to several years. Even inside the French cabinet the level of attention-to-detail is equally impressive: not only are the internal shelves made from solid oak (an excellent carcass timber), but the shelves have been designed to slide in and out for ease while each one is cross banded, book matched and ebonised for beautiful visual effect both inside and out. It’s detail, from the front to the back. Many pieces, even great quality ones are wonderful on the outside and then the quality lessens the further inside you go. This French cabinet is quality everywhere. 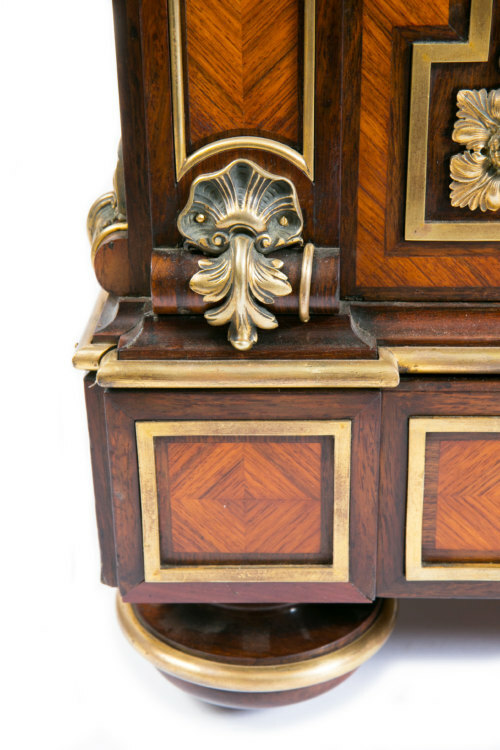 When you begin to dissect what goes into creating these antiques, you can’t help but respect and admire not only the finished article, but the heart and soul of the people who made it. Their dedication to perfection, quality and longevity is all but unheard of in today’s throwaway culture. It’s one of the main reasons I’ve always been drawn to and fascinated by antiques. For more information on this cabinet, please contact the Wallrocks team. 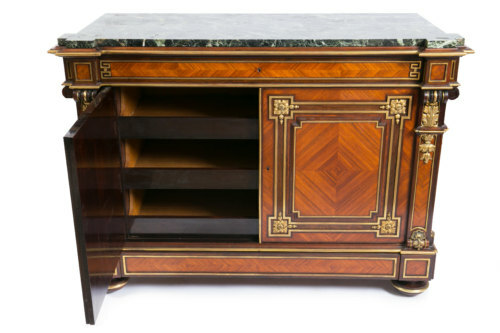 Enquire about this french antique cabinet.